I hope you enjoy using these techniques in your work. Now this is really just a few forms with sgraffito. 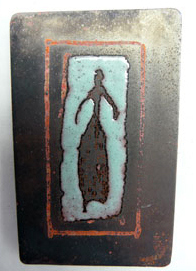 I drew lines on the copper with a magic marker and then did the enamel area scratching away the woman figure. The magic marker seems to work as a ‘resist’ for the oxides. The black is from the firings not liver. Basic sgraffitto, but I put peanut oil on the bumps and areas I did not want enamel which caused, I think, the pitting that I like. 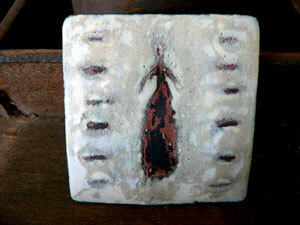 I stoned down the piece and cleaned up the copper of the woman shape and livered it. The liver ‘dyed’ the enamel part too. On these two I scratched out the shapes and then fired the enamel. 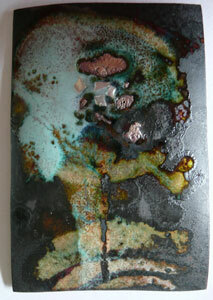 I then cleaned up the copper in those areas and put small chips of silver there. I heated to reticulate the silver in those areas. 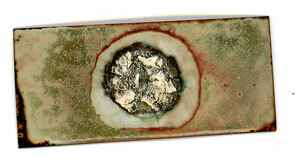 Hard to tell here, but when this piece was all enameled I put silver chips on the top of the enamel and heated it again. Some of them sunk to the bottom and reticulated. They look coppery in this photo. Then there are some that stayed on top.